We’ve been amazed by the variety of software that people have written for, or ported to, the Raspberry Pi. Today, together with our friends at IndieCity and Velocix, we’re launching the Pi Store to make it easier for developers of all ages to share their games, applications, tools and tutorials with the rest of the community. 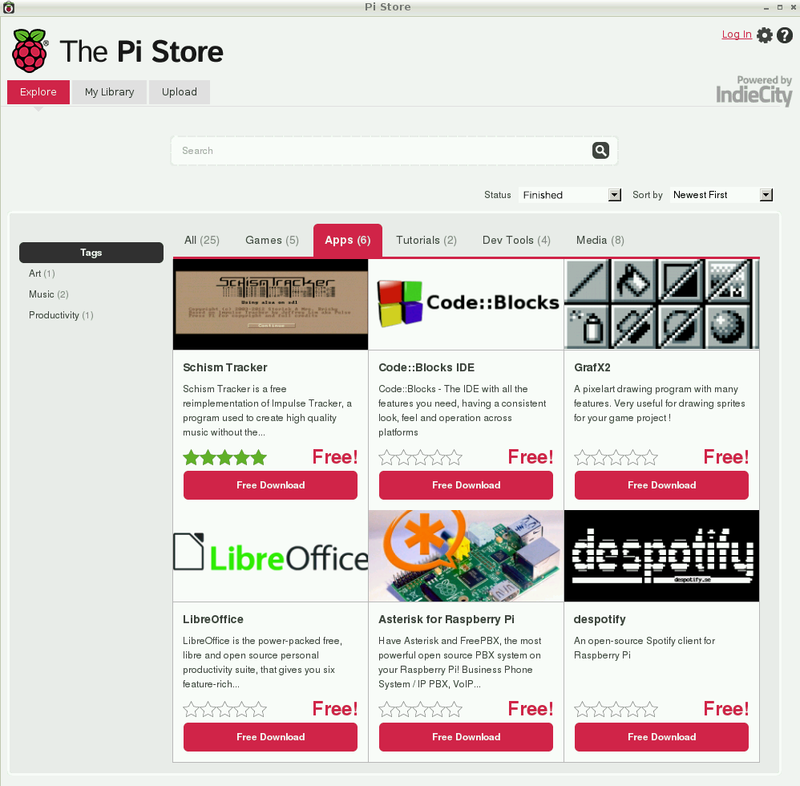 The Pi Store will, we hope, become a one-stop shop for all your Raspberry Pi needs; it’s also an easier way into the Raspberry Pi experience for total beginners, who will find everything they need to get going in one place, for free. The store runs as an X application under Raspbian, and allows users to download content, and to upload their own content for moderation and release. At launch, we have 23 free titles in the store, ranging from utilities like LibreOffice and Asterisk to classic games like Freeciv and OpenTTD and Raspberry Pi exclusive Iridium Rising. We also have one piece of commercial content: the excellent Storm in a Teacup from Cobra Mobile. We hope that the Pi Store will provide young people with a way to share their creations with a wider audience, and maybe to a make a little pocket money along the way; as well as offering commercial developers an easy way to get their software seen by the Raspberry Pi community. To start with, we’ll be encouraging the winners of our Summer Programming Contest to upload their entries to the store. Anybody can submit their own project for moderation and release. You can choose whether to make your content free or paid: the store has a tip jar mechanism, so even if you’re not charging (and not charging will get you far more downloads), you still have the opportunity to make some money from your development work if people really like it. You can submit binaries, raw Python code, images, audio or video; and soon you’ll be able to submit Scratch content too. Raspberry Pi-related media of all kinds also has a place in the Pi Store – we’re carrying the MagPi, and hope to be able to host as many of your homebrew tutorials there as possible. We’re hoping to see everything, from hobbyist content to full-blown commercial software. 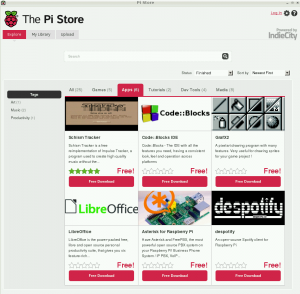 As ever with things Pi, the community is going to be key to making the Pi Store great. As well as submitting your own projects (and there are tools in there to help you get started, like free sprite packages for budding games developers), you can help us out by reviewing and rating the stuff you download. The Pi Store has a recommendation engine which is tailored to you and your preferences, so the more you review, the better the recommendations we’ll be able to offer you (and other users) will be. If you rate and review constructively, it means the really great content that gets submitted will percolate up to the top, where everyone can see it. If Liz rates games I hate highly (and believe me, she does: most of her favourite PC games have customisable half-elves in them), that’s no problem: the engine reflects your personal taste, and will learn that, displaying a different selection of recommendations for everyone, once enough ratings are in. We’ll also be adding achievements and leaderboards shortly. We’ll leave you with a video of Storm in a Teacup in action. Not sure I like the idea of monetising pi development. Why not? I can’t think of many better ways to encourage kids to get involved in developing stuff, myself – and we’ve said it again and again here: we believe entrepreneurship makes the world spin. I think you’re wrong: in the twenty minutes since we released the news I’ve had emails from two kids asking about uploading content. And precisely zero from adults. I hope it’ll turn out as you intend but something tells me 3 months from now it’ll end up as I expect. Best of luck. I don’t think that teaching kids capitalism is a bad idea. The RPi is teaching kids a lot of good things on several fronts, not just programming or electronic design. When I was at school (mid 80’s – ouch), I actually sold software I had written . I didn’t end up as someone fixated on money (far from it), and it gave me a great incentive to do the work in the first place. It’s not capitalism at work here, it’s being paid for your efforts. Precisely. We all wanted to write the next Manic Miner back in the 80s, and the bedroom coder really seemed to be able to do it. Let’s see what the new generation can come up with. Paying for a game never stopped us from hacking it and figuring out the techniques involved. Not half – I know a lot of adults now who wrote code they were paid for as kids. They’re all around my age (mid-thirties), because the environment where you could do readily that went away some time in the early 90s. We want to see a return of that dynamic. Actually, what do you mean by “exploiters’ and the change in attitude towards user content”. Note the Foundation is in charge of the ‘shop’, not some capitalist company out for every penny (ie. Apple or perhaps Google). What do you EXPECT will have happened after three months? Hugh, there is absolutely nothing wrong with capitalism – try a world without it and you have a Cuba, which still needs a Russia and China providing through their capitalism. Free is great for all of US, that take and never contribute. I love this program and will be glad to contribute through purchase… thanks for what you all are doing here. Indeed – why not? Software doesn’t have to be free! I’m a firm believer in getting paid for your efforts (if you want to be paid – many people don’t of course), and this is a great, and easy, way to do it. Of course, if you don’t want to pay for stuff, you are not obliged to. Also note, only a subset of Pi development goes on here, a lot of the hard work behind the scenes (on the OS fior example) you still get gratis. why not a tip jar for the OS developers. i would happily throw a few quid in the tip jar to someone to help them develop accelerated X, or a stable scratch platform. Interesting idea. Not sure how that would fit in with the store though. It’s up to the developers as to whether they want to charge or give away their work for free. The paid content just ends up paying for the bandwidth needed to host the free stuff. There’s also nothing stopping you from putting up a program as a paid download and still providing the source for free anyway. I think is a good idea to pay somebody to make a good work. I think the “tip jar” approach will work out fine. People who try charging too much will simply get fewer downloads. The good free stuff will float to the top of the league tables etc. There will be loads of free stuff. I think over time the “market” will sort its self out. It will give everyone a platform to share their stuff, especially those that don’t have their own websites. The hard bit will be moderating what could be a flood of content and ensuring it is a sensible level of quality. The next time someone announces a “Raspberry Pi Killer” it better have its own app store or it will look even more like a joke! (the cost and power consumption are usually enough most of the time). Another amazing bit of work by the Foundation. Having seen the worries people should remember that although Linux might mostly be free as in speech it doesn’t have to be free as in beer. The great RMS himself sold disks of his initial GNU stuff to companies in order to have a wage. The GPL for instance has never blocked people from charging if they wish – it is the freedom of the access to the code that is important. A place to share all the Pi related software and code. Wow! Certainly a great tool for pi users and developers. I’m a little confused: Is LibreOffice/OpenTTD from the pi store the *same* as from debian repos, i.e. the store is a new interface for apt-get? Or are the applications in the store maintained separately, so the store can offer for example more recent releases than debian? My guess is the store will mostly be a front end for apt get. In theory sounds like a great idea, just hope that everyone realised they’re Licence obligations before trying to sell stuff. Not in all cases, but it’s a good point. And regarding the controversy, I’m an anti-capitalist myself yet I don’t see the problem with kids getting some money for what they program if they want to: I would never do it but it’s a personal option. Very 80’s indeed, when bedroom programmers made awesome games. On the other hand, I’d like to be able to access downloads with a browser too. I could buy Storm in a Teapot from my desktop Linux machine, but I just discovered that I have to install this pishop software on the Pi: being able to download it straight away from the Linux machine and send it to the Pi via scp would be way more useful to me than having to install a full X enviroment on the Pi (wich I don’t use/like). Keep up the great work! This Pi thing gets more awesome by the day! Not sure if it was mentioned in the comments of the Article about the new layout, but I can’t see who has posted the Article. It would be great if that could be included again. I think the IndieCity guys are doing a spot of bug-fixing at the minute. Should be back up very shortly. That’s nothing to do with the raspberry pi foundation. If you have issues with RS then direct your complaints at their customer support. Wasn’t it the foundation that picked the distributors? Or did they their take distribution rights by force? Fortunately, contract law is such that an individual’s opinion — however important it may seem to them — cannot trump it. Notwithstanding that doesn’t exist, you have been waiting a week for the item to arrive – where are you and where did you order from? It can take at least a week to reach some places once dispatched. N.B. If you have any issues with the delivery of your Raspberry Pi orders then please visit the forums. This thread is about the Pi Store. Thanks. What about content in foreign languages? Tutorials for example. I think this is a great idea. Can’t wait to have a mooch around! Is the online store working? I can’t seem to get to it. Handling licenses will be tricky, especially when re-distributing stuff done by kidz. Is a library used in the project GPLed, for instance? This would mean the end product needs to be Open Source (so in effect can’t be sold). Did the programmer just copy code over from somewhere without giving proper credits, etc. Do you have (as Raspberry Pi Foundation) enough manpower to properly check all that goes in? This may be a can of worms and takes weeks to have your stuff checked when publishing on iTunes. The GP licence absolutely does not mean you cannot sell it, only that you need to supply the source code on distribution. In addition, it’s not strictly true that using a library means your application need to be GPL’d as well. However, GPL does need to be obeyed where relevant. And give permission to redistribute that source under the GPL. Which means you aren’t going to be selling many copies before someone legimitately puts it on the web for free. The FSF claim that linking even dynamically against a library is creating a derivative work and hence with a GPL library brings the program under the GPL, whether that is actually enforcable I don’t know. The FSF may claim that but I don’t think it has ever been to court. I’m of the opinion that dynamic linking should not make the *application* automatically GPL – for example, should a space invaders be a derivative work of, for example, a library to monitor key presses? But the FSF is entitled to their opinion! As to the legitimate free version – that’s the risk! I I wanted to make money, I’d be writing as much as possible myself, and using BSD licensed code for the rest. That free copy doesn’t stop other people from deciding to pay you for your efforts, though. I think the Humble Indie Bundles have gone a long way — millions of dollars in sales and to charities — towards dispelling the notion that people on the Internet aren’t going to pay for a creative product and support a developer even when a free copy is just a quick Google search away. Very nice, it will help to get new software for their Pi. I will upload WebIOPi ASAP ! waah, amazing news! Well done all, this is exactly what the community needs going forward. Creating a centralised place for entrepreneurship can ONLY be a good thing people! Its a shame some people here get so caught up on the issue of getting paid when it comes to rewarding talented people. I’m all for people getting paid and making great software for years to come! It’s also an easy way in to Linux for newbies; and as far as I’m concerned, anything that gets more people using Linux is terrific. How’s does the user protect against malware? Does the store provide any support for this? Everything is moderated (for content, not quality) before it can be uploaded. And if we do miss something – like a surprise willy on level 101 of some game or other – there’s a facility for users to report it. But malware should never get through. I think you’ve just invented a brand new game! I’m with you, that’s a great name for a game! Will I be able to run XBMC within Raspbian, or do I still just run Raspbmc? Will the store be able to differentiate between 256mb and 512 versions of the Raspberry, like Google Play differentiates between phone capabilities? This is not good. This everything should be free. So much so, you should distribute pi for free. Will be having a look at this tommorow, as i have finnished for Xmas. I think this will really help get children involved, as it will show tham what is possible. What about those under 13 (I am 11). You cannot join until you are 13. Would that be different if you were on the pi. Seems like a missed opportunity to name it the Pi Shoppe (as in Mrs. Miggins’ Pie Shop http://en.wikipedia.org/wiki/Mrs_Miggins). Generally, I am opposed to this whole app store trend, because it tends to screw people over. You never really own the software/video/music, and old versions disappear and you are left with a current version which introduces bugs and you have to end up hacking your device to try to get a version that works etc. Typically they discourage changing platforms and even if you buy a “license” for a product for one platform it isn’t independent of the store – so even if it’s a platform which is shared, like Amazon or Google Play both supply Android apps, the licensed purchased in one is not transferrable. Even “Indie” things like Humble Bundle are the same – if you buy something through Humble Bundle, that’s where you download it. My vote was for “Raspberry Sauce” :D Although I claim TM on that from last year I think. Outwitted by my own pun, Raspberry Source even. To be fair, all software decays; I have a stack of games that used to work in DOS, or Windows 3.1, or Windows 98, that just don’t work. There are a few old Linux binaries I have that refuse to run, some source that will probably never compile again, and old packages that have been abandoned. HumbleBundle is great, since you can download those files and burn them to a DVD – but eventually, that’ll die, too. Really, though, is a Debian-based “app store” much different than an “apt store”? I love it been waiting for a collection of games and apps rather then lurking the forums trying to find stuff. I’ve installed the pistore on my Pi and I’ve registered an account at Indiecity. I wanted to buy Storm in a Teacup, but as far as I can see I cannot buy it unless I have or create a PayPal account. I do not want to create a PayPal account. Is there an alternative way to buy apps in the PiStore? No, that does not seem to work, if you’re living in Germany. They ask me for a password and a password confirmation and they want me to agree to their terms. Really? I’m in the UK, and at the bottom, underneath where it asks for username and password, there’s a “don’t have a PayPal account?” section which allows you to pay as a guest. I’ll have a look into whether it’s only available in certain countries for you, though! Awesome idea, downloading and installing now. It’ll be a great centralised place to see some cool and innovative Raspberry coding. Of that I’m sure. What might the benefits be of installing, say, FreeCiv or LibreOffice through the new Pi Store instead of installing them from the Raspbian repository? I’m inclined to do the latter, because it keeps everything up to date and allows simple removal of applications later. Although, may i suggest a namechange to “bakery”? or “PiBakery” lol. I am a big open source software person, which as pointed out above, does not in anyway mean you can not sell OSS software. I often donate to projects that I want to stay around (magpi, raspbian for example) for essentially selfish reasons, with the side benefit that the people doing the work get some compensation for it. I have always felt is was a little unfair that I have to give 10 or 20 bucks to help keep the software around for myself, when if everyone who used it just kicked in a buck or a euro, the developers would make more money and my self serving goal would still be accomplished. I see this store as sort of doing that, ensuring that for developers who want to make a living off of what they do or at least get compensated for the time and effort they put into it, they can require everyone who uses it to kick in a small amount so we all benefit in much greater amounts than we have to contribute. I’m pretty sure that in practice, that’s what we’ll see happening: I hate to get all Keynes-y, but I think we have a fairly good idea of what the market will support. We fully expect to see a majority of the content on there offered for free (possibly using the tip jar), with successful commercial content coming in at a low price; higher-priced stuff is very unlikely to do well or bob to the top. You may not modify or redistribute this content. I am guessing that is the default license when setting up a product and will get ironed out over time. The problem is that according to our terms we also allow content creators to specify their own licenses, and some are listing licenses more open than our remix one. A fix will therefore go out tomorrow that adds a 3rd option: “Specify your own license”. We’ll then list whatever they enter in our license section on the game/app page and I’ll get the current devs to update their games & apps to show things correctly. Also, is there any guideline to upload apps for the Pi ? That may sound like a very beginner question (and it is !!). Which Raspberry PI implementation of Linux should I install, and where can I get it ????? you need raspbian ! whever an updated existing install or the latest image. Look at the top of the page. There’s a tab saying “Downloads”. Download the latest version of Raspbian Wheezy (follow the instructions: it won’t work if you just drag and drop), and you’ll be all set. Cool !!!!! I just need time to actually do it. Too many things to do, not enough hours in a day. lol, and so begins the era of Raspberry Pi Software Piracy. Not that it’s a /bad/ thing… The drive for unlimited free games on the Commodore 64 and Spectrum is what drove the majority of kids of the time to understand their machines– it certainly was the glue that held the community of us together at high school. For every two kids interested in developing, there’ll be 80 interested in developments to get around copy protection. The Raspberry Pi is definitely the microcomputer of the 21st century. I may have to scout round for ‘furry’ and ‘my little pony’ game developers, and get them to convert them from flash to more pi friendly languages. Of course it would be child friendly games, as there’s also a lot of adult ones which obviously would not be allowed… unless an underground store were to be made, with parental protection services. Who is the Author of this post? The author’s name appears to be missing from this theme. I always assumed all of the articles are written by Liz, but the wording of this article makes it clear Liz did not write this. This is probably just an oversight of the redesign. But one that should be addressed. Eben, with help on the spelling from Liz. Probably. The lack of author is being fixed when the web dude has time – it had been noticed. Eben with *cough* some help from Liz. The author name will be back on each post asap. Will Mooncake be releasing “Ride the floor waxer”? Keep up the, extremely, good work! I think that anything that makes it easier for newcomers should be welcomed and i see no arm in allowing youngsters the chance to make a few quid for their efforts. Surely that will only encourage them to become better programmers and wasn’t the aim of the Pi to teach programming to youngsters? Slightly off topic but does anyone else hate he term Apps? I hanker for the good old days when we had terms like computer program and software and yes, even applications. Hearing people talking about Apps just makes me cringe. I do believe i may be turning into a grumpy old man:(. Re neologisms: I know how you feel; there are plenty I really dislike too (mentee and webinar are right up there). But language is an evolving, living thing; and as one person holding back the flood, Canute-like, I’m fully aware that I should just go with it and embrace “apps”, because they’re definitely part of our discourse now. I’m still not setting for “mentee”, though. It’s bloody illiterate. 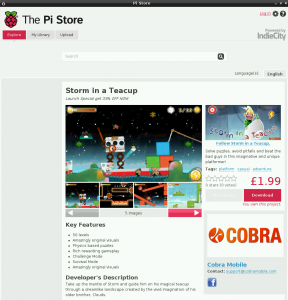 Hi, this isn’t a comment about the Pi store as such, but about the new layout for the site. Can you add a link to the article comments at the bottom of each article? As it is, I need to scroll back up and find the start of the article to find the link, and it’s pretty jarring. Having the comments link at the bottom is much more logical, I think, but there’s no need to drop the link from the top. So, can we have comments links at the top and bottom, please? Go back a few posts to last week – there’s a comment thread there where we’re asking for this kind of input, and if you post it there, we’ll see it! It’s as if you are *watching* me. In a hat. Nervous now. Oh that’s a hat is it? I was going to ask where I could get a chop job like that:). I think this is a great posibility for begginers to show our work. Us too. I really hope you’ll upload something! I just want to say I love this, I think this is a great idea for kids and beginners to get better access to Raspberry Pi software. But I’m curious, how can I upload my own apps? I click the “upload” button, and it asks me for my company name! 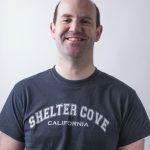 I don’t own a company, and I probably wont have the money to start a company for a long time. This would also seem to be problematic for children, and most other people as well. Are you trying to upload through the application on the desktop of your Pi? You can’t do it via the browser. Liz: I’m doing it through the desktop. Hannah: OK I see. “TeaAddict’s Apps and Games”. Sounds nice! :P I’m still a bit of a beginner to programming, but in a couple of months after I’ve learned more, I may be uploading something! Thanks for your help. Again I want to say: I love this idea! how about a Pi Image Store too ? much like the “‘downloads” page of this site but as a web store where people can upload their images. Also with an option to customize an image by adding features and/or setting parameters (IP configuration for instance or the hostname). then just write the downloaded image to a SD card and plug it in the Pi. I think this is an interesting idea, but I have deep reservations. The star-based rating system is a broken mechanism to find content: it inevitably favors ‘market leaders’, discriminates against new entrants and ends up with a small number of apps taking the lions share of the market. In the Apple/Google/Microsoft world these distortions don’t matter, because the store is there to make money for the store owner. But the foundation is supposed to be about community and collaboration. Whilst I think encouraging kids to sell games for pocket money is a brilliant incentive, being crowded out by a commercial publisher with more resources is going to be a harsh lesson in scalable economics. Personalized recommendations is a step in the right direction, but I’m not sure it’s enough to deal with the fundamental ‘winner takes all’ bias inherent in the star ratings system. Make the “Best of the Week” the main feature on the front page. The App download page should be more like a project page, a bit more like github rather than an app store. Atleast something to bring more of a community feel rather than commercial. Commercial opportunites shouldn’t be discouraged entirely though. PLEASE disallow malware (especially the adware variety which loads “content” [ads] from third party interweb servers). Lest we poke the eyes of honest f/OSS developers. I’m not sure of the exact rules, but I expect that sort of thing will be frowned upon. The shop is to help Raspi people distribute their wares, and perhaps make some money. Not for big add companies to come in and make money off. What a great idea, cheers! Iridium Rising is an interesting display of the raspberry pi’s graphic potential. Just a quick note, when I tried to install the pistore it said the tar was corrupt, my pi froze and crashed and then when it rebooted I got repeated *kernel panic* errors. I’m guessing it was my SD card or the fact I was using overdrive that caused it but still it makes me sad. yes, already did that, seems I’m not the only one with this problem. I dream about it, and you did it !! Isn’t this interesting? While Ubuntu gets contiuosly bashed for providing the “Ubuntu Software Center” which also features commercial payware, there is no such outcry of protest when it is done by others. Personally, I don’t like the idea of the Pi store, mainly because it compromises the commuity spirit that gave birth to a lot of code which Raspberry Pi is also using. Yet, since I do not need to install the store for the OS or the Pi to wrok, it does not bother me either. Remember, not everyone bashes the Ubuntu store for commercial apps. I don’t for example. You just hear the loudest shouters. As with any complainers. Very few people can be bothered to write and be complimentary about something, whereas complainers are two a penny. And I’m not sure why this compromises the community spirit of the Raspi. If anything it gives the community an easy way of sharing their stuff – remember, free stuff is expected to be in the majority. Also note, code that underlies the Raspi, the Linux kernel, Arm side drivers etc, are all open source, and available via a different route. I just fear that a lot of GPLed code may eventually end up in proprietary applications. It’s not something done intentionally, but I don’t think that young / unexperienced developers do not know about the problems here. Kids want to code and to show off and maybe add up to their pocket money, not deal with the complex legal issues of coding. The Pi store may give them the impression that GPLed code may be sold as part of a proprietary license. Maybe I’m just too paranoid, and nothing like this will happen. Maybe the store really is a good thing. I hope for that. It’s something we will need to look out for. I keep reading Pistore as Piss-tour… I did one of those once in my youff! This is great for us old timers who don’t get going everywhere for KOOL stuff now its can be in 1 place and for free—– Take that G!#@$! apps! Will there be anyway for PPAs to be added to this? If so I’d like to use it on my Ubuntu netbook, cause I hate how slow the software center is. Or am I totally missing how this works? My problem with the RPi store is that it’s riding on the backbone of Linux and the “Linux way” doesn’t encourage that kind of thing. I wonder what rms (or Torvalds for that matter) would think of monetizing Linux based development? Gnu has always been free and one of the best things about the Linux experience is that if you want something you just use aptitude (yum, or whatever package manager you choose) and install it (sometimes you have to get the source, configure, build and install -those are the fun ones). The point is that concept is cornerstone of the Gnu and Linux experience. Mobile app stores have a long history (I’ve been involved with mobile development since the early 00’s) and the paradigm is well known for that platform. App stores for desktop does not have a long history of app stores and it’s a fairly new concept to desktop users. I’m sure RMS would be fine with it – he has never said that Linux software shouldn’t be paid for. Free as in beer is NOT the cornerstone of GNU, it’s the other free – the freedom to do what you want with it that is the cornerstone. It’s a complete myth (or perhaps a mythunderstanding ;) ) that profit/money-making software can’t be built using Linux or most OSS. Only _modifications_ to existing code need to be published, not proprietary software that only calls OSS code in libraries or via an API (e.g., network-based services). Many tens of thousands of profit-oriented entities build profit/paid-based products using Linux or OSS completely legitimately. We’ve been doing this with Red Hat releases at TiVo for 14 years, and have been awarded and successfully defended dozens of patents on the proprietary portion of our code. Google’s Android mobile OS is another variation on this theme. I really wish people who think that every profit-oriented effort is evil would just donate all of their ill-gotten income (and worldly goods bought with it) to the Foundation and solve all of the world’s problems in doing so. Ohhhh, I see, you only want everyone _else_ to stop feeding/clothing/sheltering/etc., themselves, their family, etc. Sheesh! Can anyone help? can I not manually add the repos to install it? Will this be how minecraft is realeased? I also tried the “apt-get install pistore” and received the same error message. Looks like the pistore app is not available on the server for download?! I’ve had a look at the web page of the market, could you please add a filter for the Free (as in Freedom) and not Free license, so I can avoid to check project by project what the license is? Otherwise this will become like Android market, where the only criteria is pay/not pay, that is bad once you have hundred of programs (where I solved the problem thanks to FDroid app and repository). Also this could restore in me the hope that the project really has a focus to Free Software (“trust us, we will open it as much as we can”, or something like that I’ve heard in a conference) and is not a brand new chain with different colour for our children. Sensible idea on the licence. But remember the focus of the Raspi is NOT free software! It’s teaching computing to a new generation of programmers. If that can be done with free software, great, but I think there is certainly room for paid for items as well. You are mixing the concepts. Free(dom) is not free (as in beer). I’ve nothing against Free software get money, all the contrary! I’m against a teaching and education tool that runs proprietary, closed, obscure code on it, don’t mind if given away “for free” or not. Whey there will be a lot of proprietary sw in Raspberry, and this will depress the development of Free(dom) software that can’t compete in a business model where closed source is going to get more money and have more features, you will end up having a Raspberry no one cares to hack and program. Sharing Free software is sharing knowledge, sharing proprietary one, for free or for money, is NOT. Do do a good job they should totally forbid proprietary programs and create a “donate” system to push freedom and sharing of knowledge further. That should have been in the right direction for a project who’s goal is to increase education, IT knowledge, sharing of idea and so on. I completely disagree! I think there is more than enough room for both free software, and propriety software. After all, that’s how the real world works. I see no reason why proprietary software will depress the development of free software, or even if that is a problem anyway. Sharing Free software is sharing knowledge, indeed, but that is not a reason to not allow propriety software. After all, people still need to pay their mortgages, or get some benefit back from their effort – or do you expect the whole world to work for free? This isn’t the Federation – money is still needed. TBH, I’m not expecting anyone to get rich on the back of this, and I also expect the majority of software on the Pi store will be free. If you are against a teaching tool being closed (you must be against almost every teaching tool out there with that POV- teachers, the ultimate teaching tool, need to be paid, books need to be paid for), then I’m afraid the Raspi may not be for you. The Foundation takes a pragmatic approach to teaching – what works best, and if that involves closed software, so be it. Still, best of luck. Raspberry Pi is a brilliant idea and I wish you every success with it. I know I’ll be ordering one in due course. An official pi STORE?? Do you seriously expect children to buy games with a credit card? Isn’t this very far from the Charite aims? I could understand the creation of a site or forum where children can put their software to share help or to show how good they are in a very creative common way…. Crikey. Way to miss the point. Yes, it’s a store, where we expect the majority of stuff to be free..it’s a great facility for allowing people (those children you mention) to distribute their ‘wares. They can charge if they want, or just ask for ‘tips’, or just use it as a simple way of getting their stuff to a wider audience. And of course, there may well be commercial software available, for those that want it. It’s not exclusively one or the other. Before Open Source software there was PD (public domain) software free on the Amiga as well as other platforms. In 1991 / 1992 I made some money with the LicenceWare software network that had been set up buy the people running the PD libraries, this worked well. It was this system that made me realise that I could make a living being a games programmer. Is there a way to use this without connecting the Raspberry Pi to the Web? I purchased my 10 year old son a Raspberry Pi for the holidays. We’re very excited about the new app store, but his Pi (located in his room) is not connected to the Web, and won’t be until he’s older. I would imagine many parents of younger kids haven’t connected their kids’ Pis to the Web, so perhaps this is of concern to others as well. No, but I’m sure you can supervise him in downloading stuff (via the store or apt get) in another room, and then let him go back to his bedroom. Is this just for Linux users or can RISC OS users submit applications too ? There’s no mechanism to run them under RISC OS, I’m afraid. Any chance of setting up a RISC OS store then ? I’m in my mid eighties but not yet senile and wishing to download editions of MagPi I haven’t yet got ( ed 3 onwards ) why should I have to jump through firey hoops to get them from RasPi Store? Indiecity is my bugbear; I joined the club, installed the downloader package & finished up with my browser rattling up 900 plus tabs. Since all this I’ve removed Indie–ity NOW how can I get these MagPi copies please? Many thanks Clive but I’d already been there & got my copies.You beat me to then getting back here to add update to my query. Thanks again and Seasons Greetings. This is a great idea and I was going to start such an effort soon if no one else had gotten around to it because I’m going to need such an outlet to distribute my Pi-finity! STEM and programming teaching 3-D game system (yes, Virginia, there is a Santa and there is a Pi-finity! coming soon to a Pi near you). I don’t like the Pi-only store app not just in principle but in its design and execution – it should be an off-the-shelf browser-based app (it was a pain and slow to install, for starters). I’m not sure whether it’s the store server(s) or network congestion but the store app loads, runs, and displays screens terribly slowly. If the load is too high (the service providers should know that there are 600,000+ Pii out there, by now), then distribute the service over sufficient resources. It’s almost 2013, not 1913, and distributed, load-balanced systems are in lots of teenagers’ bedrooms, much less pretty much every server farm on the planet not made entirely of Legos, these days (and I suspect there may be some Lego-based services with better performance! ;) ). OK, so everyone knows it’s slow … where were the developers when user interface design was covered in class and the concept of progress indicators was covered? At least give us something shiny/pretty/mesmerizing to ogle at while the bits are being pushed around by the wizard behind the curtain to whom we’re not supposed to pay any attention. Actual progress indicated is vastly preferred over just a spinning icon, BTW. Even if it eats up a bit of the performance to the point where it slows down overall download/screen-update speed slightly, having that immediate feedback is much more preferable than wondering whether an input has been accepted, whether it’s just the network, or it’s just the speed-challenged ARM CPU that’s doing the molasses-in-January imitation. You can never provide too much user feedback, especially when it’s your fault (which includes not realizing the store may get slammed with hundreds of thousands of Pii Out There) and not the users’ fault. This seems like a good idea as long as developers who want to release their games for free are allowed too. (unlike for example, on Xbox Live indie games developers must release their games for a minimum price). As for those wondering about whether this is motivated by money or a genuine belief that this will improve things, I think the real test will be what cut (if any) is taken out of the price of games that are non-free. Additionally, I was disappointed to see that a “Pi Store” account is required to download free software from the store (and that I made a typo in my last comment “to” not “too”). Er, yes. Free stuff is expected to be the majority. For none free stuff (not just games) the developer gets a minimum of 75%, most of the rest goes to the Foundation, remainder to the service provider for hosting. Very nice work on the Pi store. It’s good to have the option to charge and I presume that uploaders can change prices? As a computing and Economics teacher this is a classic example of demand & supply. For the record Ubuntu has a similar concept and I it hasn’t stopped it being one of the most popular distros. for those worried about making money…. someone has to make the money for it to be spent…. its not capitalism its commerce…. Installed Pistore, restarted, clicked the desktop icon -nothing, nowt, nada! Tried the main menu, still zilch. Removed it, cleaned up and reinstalled it again – still nothing. No error messages at all, just doesn’t do anything. Anyone got any ideas? Same problem here: I can run it from an LX terminal session though (pistore). Any clues how to fix the shortcut on the Desktop? I have installed the Raspbian “wheezy”. I don’t know where it is installed now or how I open it. I have the directory to my desktop /home/pi/Desktop. I’ve successfully installed the Pi store client, but the first application I got (libreoffice) stopped the RPi during the installation and now, after the boot I get only a blink cursor. I noticed a warning about the swap space during the boot. Do I need to create a new SD card? Or is their a kind of recovery mode? Not sure anyone using GPL code in their apps can legally use the PiStore even if their apps are free because of the restriction on redistribution… which is a very bad idea IMHO. For example, NeoRouter is a terrific addition for the Raspberry Pi. It adds a no-brainer VPN solution for many applications. Unfortunately, there’s no way to obtain, redistribute, or provide turnkey solutions using NeoRouter because of the restrictions on redistribution. It also limits use of apps to GUI-based Raspberry Pi’s which isn’t necessarily desirable in many vertical market apps. This Rasberry Pi is awesome ! You may want to rethink your store front. pi store is part of indiecity. Indiecity is part of blitz games. Blitz Games is insolvent, and no longer in active business. You don’t say! Actually, things are just fine with the store, and we’re not *quite* as lackadaisical about our business as you seem to think – but thank you for your concern. I think its not about monetization, but mostly giving users (Noob users specifically) a chance to get easier acess to software.